Milan Lucic had a goal and two assists in the Bruins’ series vs. Montreal. Nothing sears the consciousness and soul of Bruins fans like the sight of a bunch of CH sweaters hugging and high-stepping in the Garden moonlight, the building silent, a band of hooting Canadiens celebrating a playoff series triumph over their archrivals. So it was once again Wednesday evening, the Bruins minced to pieces by Les Glorieux in a Game 7, their nerves frayed from the opening faceoff, their bumbling newbie defensemen dripping rivulets behind the ears, their top two lines frozen in time and in the futility of their goal-scoring ineptitude. The final sight was a brutish, agitated Milan Lucic (0-0—0 in the final four games) jawing his way through the sacrosanct handshake line. The perturbed big man was a fright, not only in the utter incompetence of his production, but also his inability to abide politely by the time-honored code of respecting one’s conqueror in the goodbye line at center ice. NBC cameras focused first on Lucic exchanging words with Dale Weise, eliciting a dismissive shrug from the Habs’ fourth-line winger. A moment later, after shaking hands with Nathan Beaulieu and Michael Bournival, Lucic paused and grew verbally animated after firmly shaking the hand of Alexei Emelin. Lucic closed face-to-face with Emelin, kept talking, and ultimately it was Habs teammate David Desharnais who tugged Emelin on the arm and abruptly ended the chatter between the two. No matter the precise language, Lucic looked lousy. 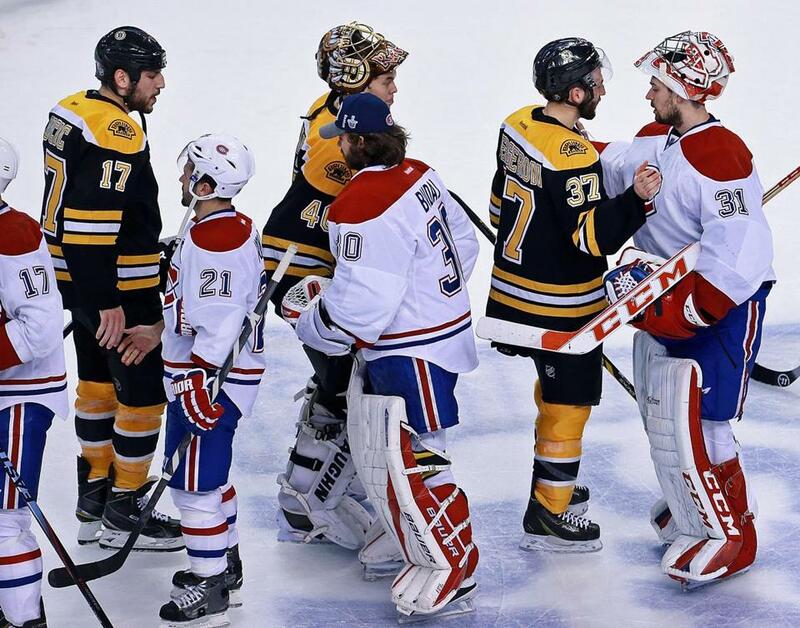 The Bruins and Habs have hated one another for decades, oozing blood and invective over their respective ice sheets, especially come playoff time. Nothing new there. Their mutual hate is what we love. But through it all, the two sides always somehow managed to end their unholy meetings with a respectful handshake and nod, albeit usually with jaws clenched, teeth grinding, tongues bitten till bleeding. Case in point: Boston goalie Sugar Jim Henry exchanging a post-series handshake with Montreal icon Maurice Richard in 1952. The scene remains among the most classic sports photographs of all time. Beaten and bandaged, the two men clenched right hands, Henry leaning forward, seemingly reverential toward the great Rocket. Respect to the core. 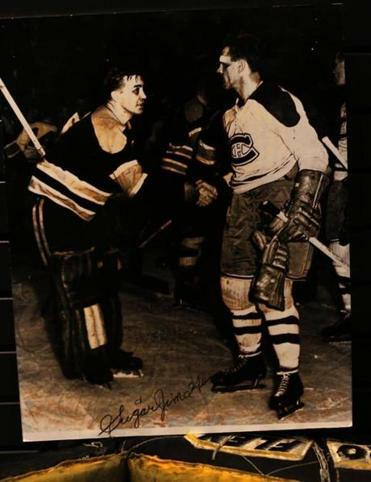 In 1952, Bruins goalie “Sugar” Jim Henry and Canadiens legend Rocket Richard expressed respect after a hard-fought semifinal series. The Bruins have suffered much harder, more shocking defeats at the hands of the Habs (Google: 1971, Dryden), and while this one no doubt hurt, the Black and Gold gave themselves a black eye in the image department with how they conducted themselves at the end of Games 5, 6, and 7. Presidents’ Trophy winners for their league-best record during the regular season, it took them a mere two rounds of playoffs, and specifically the loss in Game 7, to capture the Sore Losers Cup. Thornton came off as sophomoric and petty in his episode with Subban and was fined some $2,820 by the league. In Game 6, captain Zdeno Chara, Jarome Iginla, and Lucic, fed up with being provoked by the victorious Habs, traded pointless hacks and punches in the final minute, particularly with Mike Weaver. And in the final frame of the series, Lucic came off as an angry, disrespectful bully. Better had he simply abstained from the process and gone directly to the room. Rare are the occasions that players skip the tradition, but it happens. Ex-Boston goalie Gerry Cheevers was a conscientious objector in his days in Black-and-Gold playoff battles. The time for action isn’t at game’s end, but while it’s still in progress, but that concept for the most part escaped the Bruins in this series. They constantly worked in arrears — the Habs accumulated a total 222:42 in lead time — and imposed their strength and perceived advantage in physical will only in rare spurts. The Habs were quicker, more opportunistic, and, yes, even more resilient. Montreal appeared to be on the verge of succumbing after losing Game 5 at the Garden, falling into a 3-2 series deficit, then responded with a pair of wins in which it allowed the Bruins only one goal. Yes, the Bruins’ back line struggled, and goalie Tuukka Rask was less than his Vezina candidate self, but over the final 120 minutes of the season, the Boston offense cobbled together merely one goal, an Iginla power-play strike some 38 minutes into Game 7. 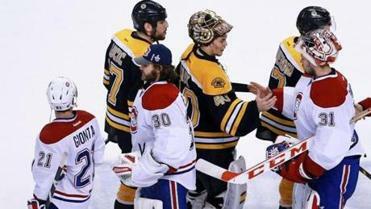 “I won’t stand here and say it wasn’t disappointing,’’ said Bruins coach Claude Julien. Julien, as is his way, stuck with template, only to see his offensive trios ossify. He eventually tried a new mix late in Game 7, yanking fleet-footed Daniel Paille off the No. 4 line and shifting him into rookie Matt Fraser’s left wing spot with Carl Soderberg and Loui Eriksson. The change did not deliver a goal, but it showed some promise, albeit far too late. The Habs have a bunch of Paille-like forwards and have built their quick-transition game around them, a game plan that now has them facing the Rangers in the Eastern Conference finals. The Habs didn’t always get many shots vs. the Bruins — they only had 18 to Boston’s 30 in Game 7 — but they seemed ever-dangerous. In the four games the Habs won, they scored the game’s first goal, on average, at 6:42 of the first period. In Games 6 and 7, they needed an average of only 2:15 to get on the board. The Bruins also scored first in the three games they won, but it took them an average of 29:13 to get that goal. The Habs raced. The Bruins chased. And that pattern held throughout the seven games. When the series ended, the Bruins had worked with a lead for a total of 58:19, a mere 13.6 percent of the time. A very hard way to win. The young Boston back line, with only Chara and Johnny Boychuk as veterans, severely missed the injured Dennis Seidenberg. Julien late Wednesday said Seidenberg might have played in the next round. Seidenberg could have settled down the unit and left the mistake-prone Matt Bartkowski on the sidelines. As the series played out, the cost of general manager Peter Chiarelli not replacing Seidenberg at the trade deadline proved deadly. But again, March is a horrible time to fix the roster, especially a void in the top shutdown pairing. No team traded for a true, effective shutdown back liner at the deadline. Chiarelli came up as empty as the rest of his fellow GMs on that score. And confronted with Montreal’s quick-strike attack, Julien ultimately had no way to counter it, his defensemen too inexperienced and mistake-prone and his forwards absent scoring touch. The top line, with David Krejci (0-2—2) centering Lucic (1-2—3) and Iginla (3-0—3), grew more ineffective with each outing. Krejci, normally a strong postseason producer, painfully underperformed. Lucic took only six shots over the final four games. The second line was slightly better, combining for 5-7—12. Patrice Bergeron, the trio’s anchor, fired more shots (55) and landed more on net (31) than any other of the top six forwards. But centers aren’t routinely shooters or goal scorers, and his constant shooting reflected, in part, the ineffectiveness of his wingers, Brad Marchand and Reilly Smith. While Bergeron attempted eight shots per game, together his wingers combined for the same. Curious math, predictable outcome. Built to win, deemed best of show in the regular season, the Bruins ultimately proved to be the Edsels of the NHL’s postseason fleet: heavy, lots of chrome, not nimble enough to win out over the speedier, better-handling bleu, blanc, et rouge. It was all over — save for Lucic’s yelling — before 11 p.m. The road to the Stanley Cup dead-ended on Causeway Street, with Lucic’s words in the goodbye line ultimately as empty as the season. On Hockey: Bruins were built to win Cup. What went wrong?